Beach Lane Books, 9781481448314, 40pp. From the mother-son duo behind the New York Times bestselling A Bucket of Blessings comes a zany picture book about a wild ride on a tuk tuk taxi in India! This picture book brings an international twist to the beloved nursery rhyme, The Wheels on the Bus, by bringing you aboard a busy three-wheeled taxi in India! Anything can happen as the tuk tuk rolls through town—from an elephant encounter to a tasty treat to a grand fireworks display. And in the midst of all the action, one thing’s for sure: passengers young and old love every minute of their exciting ride as the wheels of the tuk tuk go round and round! Kabir Sehgal started his class newspaper in second grade and has been writing ever since. A bestselling author of several books, he is also a jazz bassist and Grammy Award–winning producer. He lives in New York City. Surishtha Sehgal was a university professor for many years and now enjoys reading to children during story time. She is the founder of a nonprofit organization that promotes social responsibility among students, and she serves on the boards of two universities and a national arts center. She lives in Atlanta. Jess Golden was born and raised in the lovely little town of Hopkinton, Massachusetts. A childhood filled with coloring books, art lessons, and Play-Doh eventually led her one state over to the Rhode Island School of Design, where she graduated with a BFA in Illustration. Jess now lives in a little village just outside of Boston with her husband Jordan. Many doodles and dreams of the ultimate-canine-companion float from her little studio window. Motorized rickshaws are used around the world, and in India and other parts of Southeast Asia they are called tuk tuks. “Tuk tuk wala says ‘Squish in together!’ All through the town,” write the Sehgals (A Bucket of Blessings), a mother-and-son team, in this lovely take on “The Wheels on the Bus,” set in an Indian city. As an overstuffed tuk tuk makes its “bobble-bobble-bobble” way through town, “People in the street jump on and off,” paying their fare with rupees that go “ching ching ching.” Readers get a taste of Indian life as the book nods to Hindi beliefs and customs (the tuk tuk stops for a cow, and readers are taught the greeting “namaste-ji”), poppadoms, and the joyous festival of Diwali. Golden (Snow Dog, Sand Dog)—working in bright watercolors, pastels, and pencils with the texture and hues of Diwali color powder—portrays a busy, friendly metropolis where getting sprayed by an elephant can be par for the course. It’s a wonderfully accessible introduction to daily life in another place. Ages 4–8. ....Based on the whizzing shenanigans of the phenomenon that is the three-wheeled auto-rickshaw, the lively illustrations and rollicking rhymes ("Tuk tuk riders eat / poppa-doppa-doms /poppa-doppa-doms / poppa-doppa-doms") are sure to be crowd pleasers, especially for read-alouds and storytimes. Golden's humorously quirky watercolors warmly portray the whirl of activity on busy Indian city streets aswell as the beautiful diversity of the people who populate those streets. From grannies with glasses to ladies with top knots, from a serene yogi pronouncing"Om" from the top of a rickshaw to little girls with golden hoops in their ears, from bemused Western tourists to lively families of many shades, the characters invite readers to absorb and embrace the fun....On the whole, the sheer liveliness of spiritbehind the book's playful words and color-drenched illustrations carries the day. 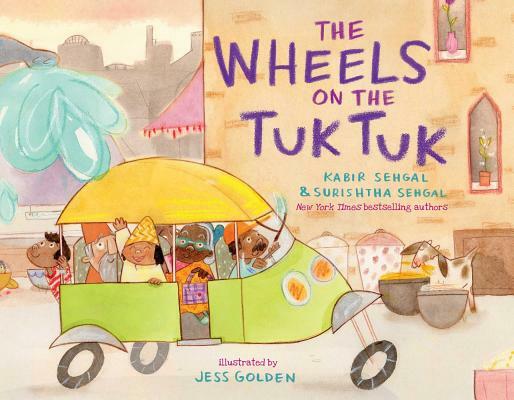 PreS-Gr 2–Thisadaptation of “The Wheels on the Bus” is set in a city in India aboard a tuktuk, an auto rickshaw used by many for public transportation. The tuk tuk wala,or driver, travels throughout the city picking up more and more passengers asthey travel to a Diwali celebration. Along the way, they encounter a cowblocking the street, a chanting yogi, an elephant decorated in paint, and somelocal fare, including papadoms and chai. The illustrations are vibrant withpastels and bright watercolors and the amalgam of people, animals, foods, andbuildings blend together effectively to transport readers to a location withwhich many children will not be familiar. Every detail in the illustrationsfeels deliberate and organic to the locale. An author’s note is included thatshares a brief narrative from the events that inspired this adaptation, as wellas a definition of some of the terms used in the story. VERDICT An enjoyable and original picture book thatwill allow readers to experience a different culture while maintaining thefamiliarity to a classic childhood song. Anyonewho's ever been within earshot of preschool story time knows the classicnursery-rhyme song "The Wheels on the Bus," where the wheels go"round and round, round and round, round and round." This joyful take on that rhythmic read-aloud ride takes children to the streetsof India, where it's thetuk tuk wheels that go round and round. (A tuk tuk--pronounced"took took"--is a small, three-wheeled motorized shared taxi that, inillustrator Jess Golden's skillful hands, looks a bit like a friendly green andyellow insect.) People in the street jump on and off, the rupees paid to themoustachioed driver, or wala,go "ching ching ching" into his hand, and the tuk tuk riders say"Namaste-ji" and go "bobble-bobble-bobble"--that'sright--"all through the town." Mischievous monkeys, traffic-blocking"moo-moo-cows," spraying elephants, and even some Diwali fireworksadd to the fun of the tuk tuk's bobbling, jumbling journey, from morning'sbustle until night when the cows are sleeping and it's time for the tuk tuk,now empty of passengers, to go home. In The Wheels on the TukTuk, India-born Surishtha Seghal and her son, Kabir Sehgal (theteam behind A Bucket ofBlessings) revel in fun-to-say words like squish and swish, andplayful wordplay like "poppa-doppa-doms" (the crisp flat snack knownas papadoms,as explained in the book's handy glossary). Golden's (Snow Dog, Sand Dog)cartoonish watercolor, pastel and colored pencil illustrations are expressiveand artful, and, with a positively edible color palette, paint a warm,welcoming picture of a festive day on the streets of India. Discover: Thepopular nursery song "The Wheels on the Bus" travels to India wherethe wheels are not on a bus but on a tuk tuk that goes "all through thetown. ".